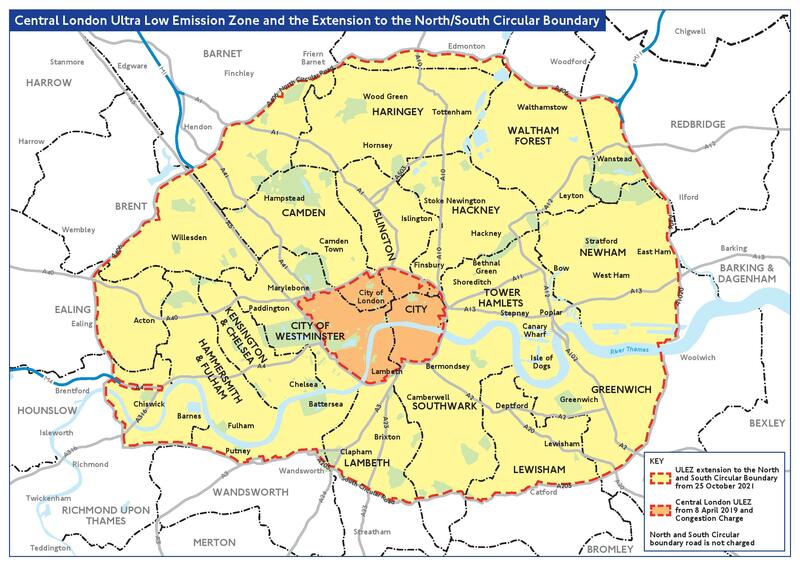 Last week saw the introduction of London’s Ultra-Low Emissions Zone (ULEZ) to tackle air pollution by requiring more polluting vehicles to pay a charge to enter central London. This is the latest in a series of policies designed to manage traffic flow in the centre of the capital introduced as a result of the mayor’s powers. Vehicles which enter the ULEZ have to pay £12.50 per day, or £100 per day for heavier vehicles. From October 2021, the zone’s boundaries will be extended as shown in the chart below, and residents will no longer be exempt. It replaces the T-charge and TfL expects nitrous oxide emissions to fall by 20 percent in 2019 alone as a result of the ULEZ. The ULEZ is interesting in two respects. Firstly, it is the only scheme of its type in the UK. Despite air pollution being a problem that is not unique to London, the capital has been the only city to be proactive about tackling it, first through the T-Charge and now the ULEZ (others have been pushed by the Government). Secondly, the ULEZ is stringent by international standards; it is the most ambitious attempt to control pollution of any large city in the world. Some other cities have implemented zones, but on a smaller scale, and often exempt private vehicles due to fierce opposition and powerful car lobbies. That said, unlike in Madrid, Milan or Oslo, no types of vehicles are banned outright. The evidence suggests it will have an impact. The implementation of London’s congestion charge, which covers the same area as the ULEZ, resulted in traffic volumes falling by a quarter from 2008 to 2018. And there has already been an 11 percent decrease in the number of vehicles travelling in the zone since the introduction of the T-Charge in February 2017. It isn’t without its drawbacks and detractors. Private hire vehicles will have to pay the charge, whereas licensed black cabs – a powerful lobby – will not. The charge does not take into account the income of the driver; poor drivers will be harder hit than richer ones. And some small businesses have complained that their business will be adversely affected. But that is the balance to strike with improving the health of London’s children. The motorist lobby is a powerful one, and successive London mayors have been brave in introducing the Congestion Charge, T-Charge and now the ULEZ. These policies are a good example of the extra legitimacy that the mayor’s office brings. It is possible for local authorities to introduce such a policy (with Government sign-off), but only the Greater London Authority has done this to date. This demonstrates the effectiveness of combined authorities in acting to solve pan-city challenges. While mayors in the UK have only a fraction of the powers they have elsewhere, this example shows what can be done with the combination of the hard powers and influence at their disposal.